We all know how expensive dishwasher detergent can be so here is a way to make you own dishwasher detergent with this simple recipe. Place all the ingredient for the detergent into a food processor bowls. Now process until the washing soda is reduced to powder. It’s as simple as that! Use between 1 to 2 tablespoons per load in your dishwasher. If you live in a hard water area you will most likely need 2 tablespoons per load. 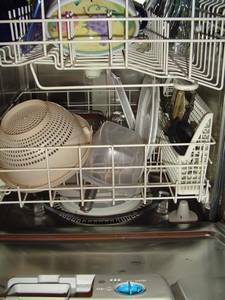 Still use Rinse Aid in your dish washer? Try white vinegar instead, it cheaper and does the same job. I use a little salt in mine too. Acts as a scrubbing agent. I love this idea – and thanks for the tip about white vinegar. I haven’t bought rinse aids in a while because they’re so expensive – but I’ve missed them. I have a big jug of white vinegar, though – does it leave a taste of vinegar on anything? That is an interesting idea. I’ll start stocking Borax. On rainy days when I run out of dishwashing detergent, I’ll have a project and then I can wash my dishes. Thanks. I love borax, it’s the best thing since sliced bread. Great tips! What is Borax? Where do I buy it?